Most gardeners in London will feel cursed with heavy clay soil. The very fine particuled structure means is has little air and water struggles to pass through it, making the soil like concrete in summer and glue in winter; planting in clay is difficult. However, clay soils are usually very fertile so if improved with plenty of organic matter like compost, it will create an excellent base for many summer flowering plants. For successful planting in clay soils preparation is key. Aside from digging in lots of compost, and mulching with compost afterwards, be sure to break up the bottom of the hole as well as the sides. This helps prevent the planting hole becoming a sump, holding water and causing the premature death of the plant. These are some of my top performers for clay soil,many of which are long-flowering. Rose - roses love clay soil. They are hungry plants so the nutrient rich soil is perfect for them. There are hundreds, if not thousands, to choose from. The rose pictured here is one of my favourites, Gertrude Jeckyll. It has a lovely scent and is one of the first to flower. Although described as a repeat flowerer it never quite repeats the first flush it gets in early June. As with all members of the rose family it's best not to plant new roses where you've removed old ones. Hemerocallis - these plants flower prolifically over a number of weeks in mid-summer. They do well in clay soil but like some moisture as well as full sun. This one is called Stafford, ideal for a "hot" border but colours range from creamy-white, yellow, orange and dark red. Helenium - one of my favourite plants for late summer. The flowers last a long time and if you refrain from dead-heading them they keep their form right through the winter. Heleniums are another good plant for hot borders with colours ranging from lemon yellow through to dark tawney oranges. Rudbeckia - my absolute favourite flower for late summer. Like Heleniums they keep their forms through the winter. I tend to go for the shorter varieties like Deamii or Goldstar as they don't need staking. Aster - there was a time when Asters were associated with mildew but most of the varieties on offer now are resistant. This one is Aster x frikartii Monch, it has an RHS Award of Garden Merit which is about as good as you can get for a reliable and good-looking plant. Japanese anemone - these flower long and late and do particularly well if the soil is a little on the damp side. 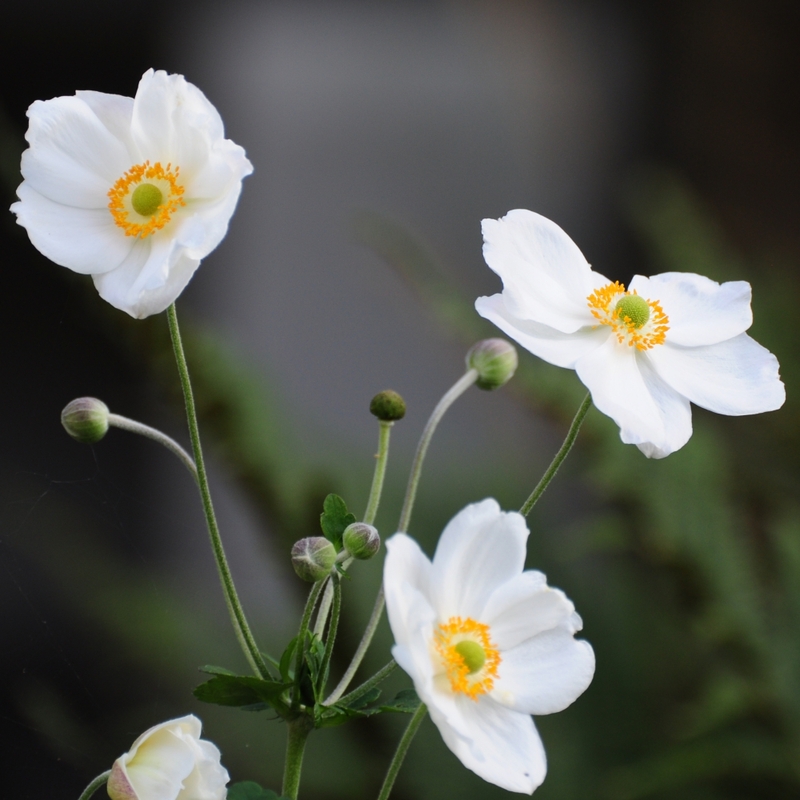 Many Japanese anemones will also do well with a little shade, making them doubly valuable in a London garden. I have found they take two to three years to become fully established, after that you may have to spend a bit of time pulling up the runners in the spring to make sure they don't colonise much of the garden. Foxglove - both the wild and cultivated varieties grow well in a range of soils, as long there is a bit of moisture. Native foxgloves grow at the edge of woodland so prefer a semi-shaded position rather than full sun all day. Lilac - Syringa vulgaris is a native shrub (wannabe tree...), is scented and attracts pollinating insects. I like the white ones but find the flowers "die ugly". If you're looking for a compact variety try Syringa meyeri Palibin. The lilac shown here is Syringa vulgaris Sensation. 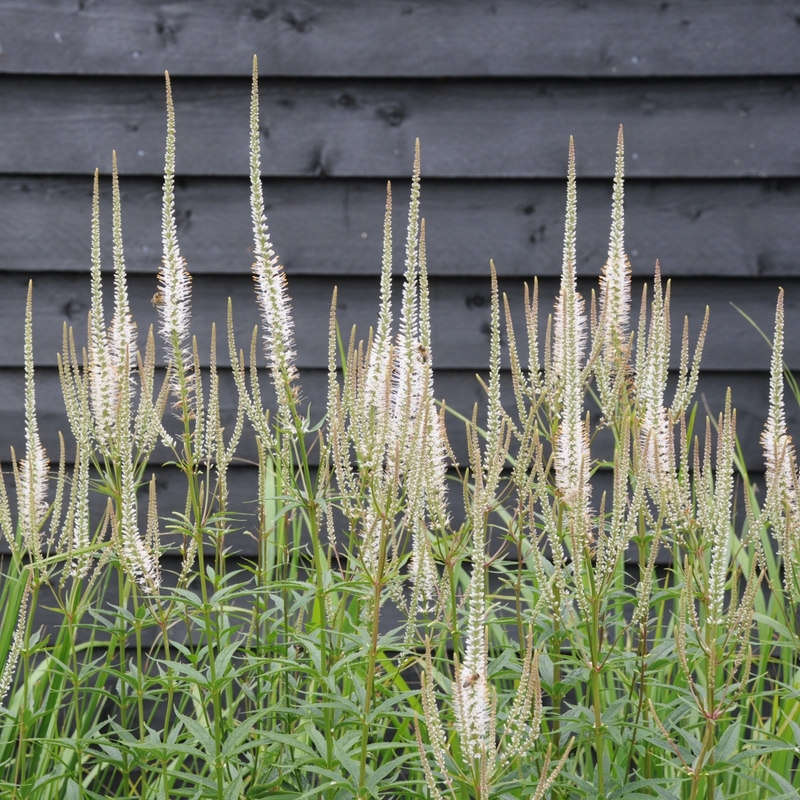 Veronicastrum virginicum - although these can take a couple of years to get really established, Veronicastrum can't really be beaten for their insect attracting power. The tall spikes rarely need staking and they make a stately presence at the back of the border. Colours vary from white through to pink and lavender.